Brumley Printing of Fort Worth is your source for commercial-quality stochastic printing. 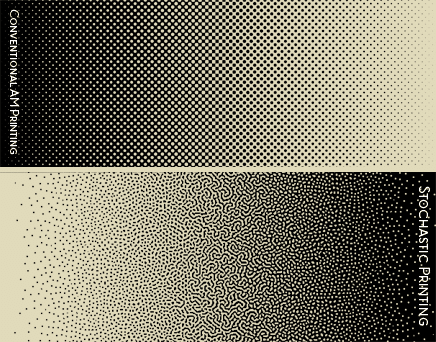 Stochastic printing, also referred to as stochastic screening and FM screening, has been around since the 1970’s and uses small, randomly applied patterns to more closely approximate the appearance of continuous tone than fixed dot, or halftone printing processes. Recent improvements in computer-to-plate (CTP) technology now make it possible to create stochastic prints with greater detail and definition, a wider color palate and improved shadow detail. Stochastic printing also tends to reduce color variation over the course of the printing run, and typically uses less ink than conventional halftone printing methods. The end results are greatly improved image quality with more vibrant and consistent color saturation. Is stochastic printing appropriate for your upcoming commercial printing job? Deciding whether or not stochastic printing is right for your upcoming printing job is not a decision you need to worry about. Our representatives will let you know if they think that stochastic screening, digital or offset printing is the best choice for your next project. At Brumley Printing, we understand that commercial printing is a collaborative process. We’re dedicated understanding your unique goals and needs, and to providing you with the information you need to make informed decisions about the many printing options available to you. It’s that kind of dedication to building long term relationships that has made Brumley Printing the commercial printing company of choice for more and more businesses, educational institutions and civic organizations in Fort Worth over the past 20 years. Contact us online or call us at (817) 336-5551 and speak with one of our friendly, knowledgeable customer support representatives about your upcoming printing job, and learn whether or not stochastic printing is right for your needs.